How did I ever decide to run 2500K in 2016!!?? Oh my. I am overwhelmed by a strong feeling of “this can never be done by me, I can never do this”. Then I calculate again, and find that it is possible, after all. I have to laugh – only 3 -4 days have passed since I set (one of) my goal(s) for 2016, and I am already doubtful. But let´s see what I have done so far – on the first 4 days of this year? This adds up to 28K over the first 4 days. If we divide 2500K with 366 days (since there are 29 days in February this year) I need to run 6,83K per day, on average. 4 days equals 27,32K. I am right on schedule, and with absolute no stress. Hey, it´s only been 4 days, mostly weekend, so how ever could this be stressful!? I just need to be confident that I will be able to find enough time during the work week, and if so, this is possible. I need to focus on why I set this goal: I want to find a way to make sure I don´t drop out after small setbacks. I need to get back into the game real quick after colds or other interruptions in my plans. One week off is OK, sometimes even two weeks can be necessary, but the way I usually fall out for maybe 4-5 weeks, is totally messing things up. With this goal, I will add 10-20K some weeks, and then get ahead of schedule, making room for the necessary pauses that most likely will be needed – due to illness, aches and pains, holidays etc. My main goal is therefor not really the 2500K in 2016, but the steady work of building form and strength through consistency. The number is merely my dangling carrot. And now it is 89 days until the Berlin half. I am getting a bit excited now – I might not manage to PR with 10 minutes, as originally planned for, but I will find some kind of speed and strength before the race, that I am sure of. If anyone reading this blog is planning for Berlin on April 3rd, please let me know! I hope you have plans, goals and dreams, and will try to achieve something special this year. Maybe not very special for others, but for yourself. This is what running means to me, at least – my own progress, the struggle to make it fit into everyday life, the joy when you sometimes get that wonderful feeling of speed and endurance – when you feel that you can go on forever and ever. I love it. I bet you do too. Run happy, people. See you soon. Maybe in Berlin? I spent 2 hours running yesterday – 2 hours with my thoughts drifting off, laying plans, thinking back. What has happened in 2015? The underlying feeling is that I have missed out on all my goals – I wanted to train consistently and strong, to get to be as strong as before my injury in 2013, and even stronger. If that is all, I have failed completely. Still, when thinking back: I have run my first two half marathons. Not fast, not pushing hard, but I did it. And considering how little training done ahead of those races, I should be pretty pleased with my performance. Motivation is everything. After the second half marathon I signed up for Berlin Half in April 2016, and 23 weeks before Berlin I started a training plan that was supposed to bring me back to my old speed and strength. I was highly motivated, did my morning runs happy as ever, and could feel the steady effort paying off. Just a few weeks out in the program I got a bad cold, and had to stop running. I hoped for just a week off, but suddenly two weeks had passed and I was still not feeling well. Since then, I have been running less, not pushing myself, no plan and no structure. I have just taken a run now and then, to keep on moving. What the hell happened? Yesterday, on new year´s, I went out to run the last run of this year. I did not decide how far, but thought I might exceed the couple of 16K runs I did earlier this christmas. After a while I decided on 20K. A good number for the last day of the year. On such a day, it is hard not to start laying plans for the coming year, and so I did. My head started spinning on the major challenges of my running life: how to get the much needed consistency in my training. How do I find the motivation to get back on track after any kind of stop in my training? If I get a cold, and the brake gets too long, the problem grows because I cannot make myself get back to the program as soon as possible. Ok, I got it. I will try to make my goals more long termed. I will run a minimum of 2500K in 2016. This means that I have to run an average of 50K for 50 weeks, and have only 2 weeks for “that annual cold”. And, for being able to cut down on mileage on holidays, I have to do the 60K and 70K weeks that I need to build my capacity as much as I want. Can I do this? Is this a too tall order for a much-too-busy woman in the year of her 50th birthday? I have no idea. But the idea came during a 20K run, while enjoying myself, so my instinct are – hell yeah, let´s do it! So listen, good people. I will run a minimum of 2500K in 2016. Please check in regularly to see how I am doing. What are YOUR plans for 2016? Please let me know, and I will cheer you on! Happy New Year – and always run happy! Week 5: get another training session into my schedule – tempo run or longer intervals on tuesday evening. This means adding another 10K (minimum) – all together a minimum of 60K. At this point I will have done 6 weeks of motivated training. I am all eager to get to it. I have an idea on how to plan for week 7-23, but for now this is what I will put down in writing. I find it important to be able to adjust as I go along, since I need to get som answers from my body as well. After all, I am a 49 year young woman! What I have been lacking in motivation the last 2 years, is back in full – and then some. If you are planning for Berlin half in April, please let me know. I have registered and booked airline tickets, and will be there for sure. Why don´t you come along? 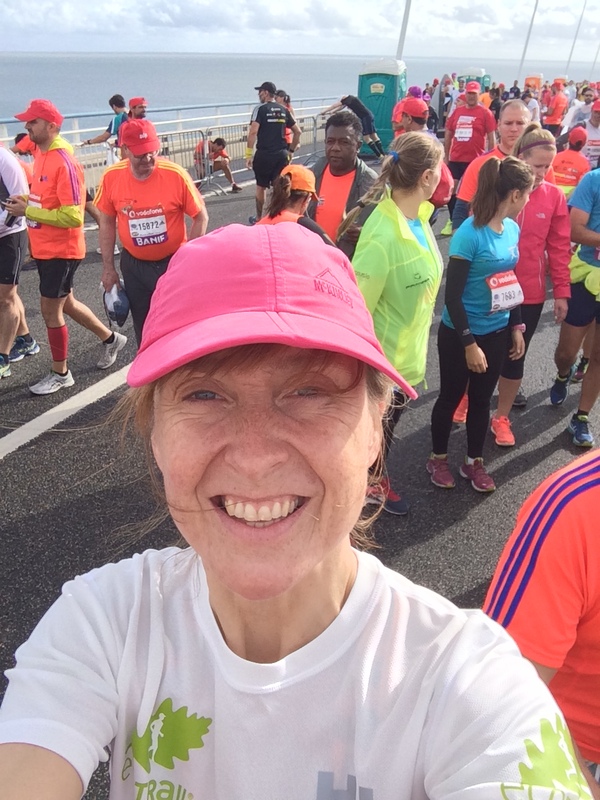 To let you in on a secret – when in Lisbon, I heard about the 100 half marathons club. Some people had actually run 100 half marathons. I started playing with the idea, and realized that with 4 races each year it would take me 25 years to make it. So now I am thinking more like – how many half marathons can I do in 12 months? I thinks this might be a whole new chapter of my blog. For now – Run strong, run long, run happy. Get yourself out there, will you! ?